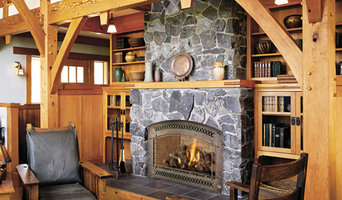 *Authorized Mendota Hearth Dealer* Established in 1982 Jerry's Fireplaces has been serving the Bay Area for many years. We provide sales, and installation of Fireplaces and Fireplace inserts. We have 25 gas units burning in our showroom so that you can see and feel the fireplaces and inserts. We are an authorized dealer of; Mendota, Fireplace X, Avalon, Lopi, Heat & Glo, and Quadra Fire. All of the manufacturers we carry are in the U.S.A. Whether you want to add a fireplace, or convert an existing fireplace, Jerry's Fireplace has it all. Our shop has been offering quality installation and reliable service for our customers since 1982, and we have expert installers and service techs on staff. With more than three decades of experience, you can rely on Jerry's Fireplaces. We carry a full line of wood and gas fireplaces, fireplace inserts (wood, pellet, and gas) as well as gas, wood and pellet stoves. All the manufacturers we carry are located in the United States. Come to our showroom so that you can experience them actually burning! *Authorized European Home Dealer* London Chimney Services & Fireplace Shoppe was founded in 1977 by Mark Rizzo as a one-truck, two-employee business that performed basic chimney sweeping services and minor masonry repairs for San Francisco, Marin County, and the Greater Bay Area. During the 1980’s we expanded to four technicians and began offering installations of fireplace components and gas logs for local fireplace shops. By the 1990’s we were up to six trucks and began to perform large-scale masonry repair and restorations. By 2001 we were a full-service, CSIA-certified chimney company and fireplace shop. Fast forward to today and we are one of the area’s largest chimney service and fireplace dealers and continue to offer the knowledge and professionalism that make London Chimney Services & Fireplace Shoppe stand out. *Authorized Kozy Heat Fireplace Dealer* The Buck Factory Outlet was incorporated in 1979 at the height of the Arab Oil Embargo, when many Americans were searching for a renewable, more "earth friendly" means of home heating. Gas shortages, higher fossil fuel costs and public awareness directed many to seek wood as an alternative source for daily household heating fuel. Since then, not only have new stove designs evolved into highly efficient and beautiful wood burning appliances, the latest stoves have received highly coveted EPA certification for clean air standards. All models include the latest air-wash systems to help keep viewing glass clean and convenient ash drawers allow for easy clean out of ashes. 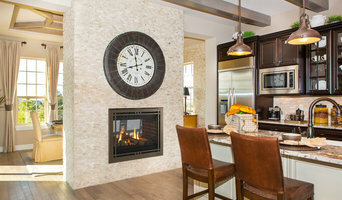 In recent years, gas burning stoves and fireplaces have become increasingly popular as natural gas prices have stabilized and "zero-clearance" fireplaces have opened up the market to homes previously without any fireplace. For example, direct vent freestanding gas stoves can be installed with rear venting, directly through a wall, (in most cases) without the need for free standing chimney pipe or previously existing fireplace. 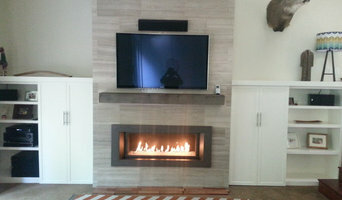 The Fireplace Element a full service fireplace store from design to fabrication to installation. We are an innovative team of stone carvers and designers. We are passionate about good looks and the end results. We care about the process and involve you in the design so that we can achieve what you have dreamed of or what you did not know was possible but love. One step at a time, we create your fireplace based on your needs and possibilities. The result: a fireplace you love looking at everyday. We care. Our work is genuine and integral. We are not more expensive than the competition. We handle remodeling and new construction. You can visit us for a product, ideas, or concepts on how to remodel your fireplace. Outdora offers a full range of outdoor living products including pizza ovens, grills & appliances, fire pits, heaters, and patio furniture. We offer our products through Outdora.com and our showroom located in Sonoma, CA. The legacy of Outdora began in California where the sunlight that permeates through the Sonoma Valley turns everything to gold – from the rolling hills lush with grape vines to the opulent lifestyle, homes and businesses of the locals. California was built on the discovery of gold, and since those “Eureka…I have found it!” days, Californians have been fine-tuning their lifestyles. This innate desire to discover the outdoors inspired the conception of Outdora, and the rustic charm and artistry of the Sonoma Valley is in the spirit of Outdora too. Designed with the consumers’ needs in mind, Outdora’s products are hardy and adaptable, ensuring maximum durability for years of use and enjoyment. Outdora offers a vast selection of the highest quality products from the leaders in the industry, including Fire Magic, Planika, Big Green Egg, Kingsley-Bate, Woodard Furniture and more. These featured manufacturers pride themselves on superior craftsmanship and use of premium – and very often eco-friendly – materials. In addition to quality products, customer satisfaction is of the utmost importance to Outdora, and its knowledgeable customer service representatives are here to help. Offering the best of the best, Outdora sells everything needed to convert any outdoor environment into a sumptuous and enchanting space for casual family dining and lounging to more high-class social scenes. The elegant homes, decor and sense of style is the soul of the Sonoma Valley, and Outdora has remained devoted to providing unique, innovative and exceptional products to reflect this gold rush style. Capo Fireside has provided expertise, sales, and service of fireplaces and hearth products in California for over 35 years. We specialize in the whole hearth system, providing design, sales, installation, and service of all aspects from fireboxes, to mantels, to gas logs, decorative chimney shrouds, fire pits and fire features. Our showroom in San Juan Capistrano has over 60 live burning displays and the top brands such as Heatilator, Heat N' Glo, Montigo, Innovative Hearth Products Fireplaces, Francois and Co. Mantels, Eldorado Stone Mantels HearthCo Mantels, American Chimney Shrouds, RH Peterson Gas Logs, Design Specialties Custom Glass Doors, Ortal Heating Solutions and much more. Our staff and crews are servicing the Top Home Builders of California, Custom Home General Contractors, as well as modelers and homeowners. We also have branches servicing Central Coast and Southern California with design centers in Santa Cruz and San Juan Capistrano. Our newest design center is now open in Palm Desert. Blaze specializes in attention to detail and the highest quality products. Our expert staff has been factory trained and certified for each product we offer - Ortal, Town & Country, Heat & Glo, Mendota, Montigo, Regency, and Pacific Energy. 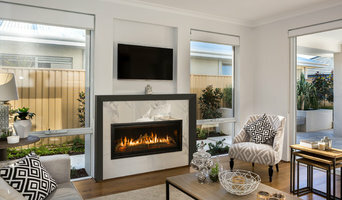 Whether you are building a new home, remodeling, or just wish to update your fireplace, our team of experts are ready to provide professional service Family-owned and operated since 1953, Blaze is Northern California's most prominent fireplace distributor with Design Centers in San Francisco and San Rafael. We are the Bay Area's premiere fireplace retailers. What makes us unique is that we can remodel your fireplace from start to finish. We are your one-stop-shop for all of your fireplace needs. Gary Edwards and Barry Tripp, learned the craft of stone carving. At the age of 15, we realized our tiny town offered limited career choices; we could either take an office job or work with our hands. We chose the latter and spent four years at the renowned masonry school Weymouth College where we earned our Advanced Craft, the highest possible designation. Upon leaving Weymouth, Barry began an apprenticeship with Ray Harvey — the owner of the company — and master masons George Greenham and Charlie Gibbs. Gary soon followed and we spent the next eight years under Greenham & Gibbs' tutelage, restoring some of England's grand churches, abbeys and castles. In the late 1980's we brought our craft "across the pond" to California and established Millbrook Stone in 1991. Together with other artisans, we strive to maintain and preserve the heritage of stone carving that has been passed down to us through many generations of talented hands and tireless care. We find it extremely rewarding to create something that is enduring and we hope you will feel the same sense of satisfaction and pride when you bring Millbrook Stone into your environment. *Authorized Mendota Hearth Dealer* Having previously worked as an installer, Efrain created Penguin Fireplace as a solution to companies that make buying fireplaces too complicated for customers outside of construction trades. Penguin is about finding the right product for the right price for each individual customer's need. Although he does own Penguin, he works tirelessly as an installer to ensure the best of quality work for each individual customer. Let us make your fireplace project look exactly as you want it. If you're not sure what you want, let us help. We reface, install TV's above fireplaces, make custom mantels, and much more! Call us to chat about what you're looking for! We sell high quality, heater-rated fireplaces, stoves, and inserts. We provide professional, expert advise for all stages of your project from design, to installation, and finally to maintenance. Serving the Bay Area since 1976, we are locally owned and operated in the heart of Dublin, CA. Our 6,500 sq. ft. showroom boasts one of the largest Fireplace, Patio and BBQ displays in Northern California. We only feature high-quality products which our customers have enjoyed since day one. At Custom Fireplace, Patio & BBQ we take pride in only carrying the best products on the market. We won't carry or suggest a brand we wouldn't put in our own homes or backyards. We are your Fireplace, Patio & BBQ Pros. Our showroom has lots to choose from and our knowledgeable staff can help you when replacing, upgrading, or creating your fireplace. We are a complete fireplace shop including sales, installation, and in-house product cleaning and repairs. We can also help with chimney repairs and chimney sweeps. Okell’s Fireplace can help you create a clean burning, environmentally friendly, and efficient source of warmth and enjoyment for your home. We believe workmanship, high quality materials, and knowledge are essential ingredients to every item we sell. Okell’s Fireplace has been helping to keep California homes warm since 1947! What should you know about buying a fireplace in Hayward? Since wood smoke contributes to air pollution, many cities have banned the use of wood-burning units. If you’d like to buy a wood burning unit, check the Hayward, CA city policies first. If your home already has a wood-burning unit that you’re concerned about, contact a fireplace manufacturer to replace your wood-burning unit with an environmentally friendly electric or gas alternative. Gas inserts can be efficient heaters and may lower your electric-heat bill. Many adjust to provide high heat on a cold night or a low-burning flame for ambience. Interior fireplaces and mantel designs are as varied as home interiors. From custom fireplace mantels made to conceal a flat-screen TV to custom hearth designs with elaborate Renaissance-style stone mantels, the latest designs can be found by visiting Hayward, CA fireplace showrooms. Find fireplace manufacturers and showrooms, plus fireplace installation professionals, on Houzz. 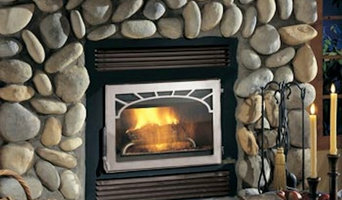 Go to the Professionals section to find Hayward, CA fireplace design and installation experts.